CPO Outlets is a leading retailer of new and refurbished power tools and regular tools, based out of Pasadena, California, United States. They are known for their discount prices, which they are able to make by strategically buying up close-out and discontinued products from other retailers and suppliers. The subsidiary company sells its tools and supplies both online at CPOoutlets.com and via a traditional mail order catalog, but there are not currently any physical retail stores. Buying online is particularly appealing because all of the offers and deals they run. These can be redeemed by using one of our CPO Outlets coupons, from our up to date list. CPO Outlets was founded in 2003 as a catalog and the online store went live in 2008, which is now one of their key drivers of sales. They are owned by the publicly traded United Stationers company and are now known as CPO Commerce, Inc. Co-founder Rob Tolleson serves as Chairman, CEO and President of the company, which makes upwards of $50 million in yearly revenue. They employ under 100 people throughout their supply chain. CPOoutlets.com stocks thousands of individual power tools, and home & auto improvement supplies. 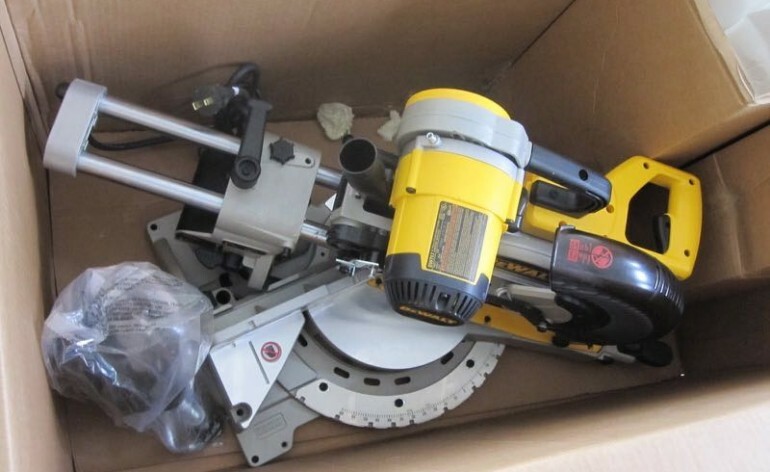 These include well known brands and lesser known brands, and are either brand new or "reconditioned" which means used or display tools have been cleaned up and/or fixed for resale. Some of the more popular brands available include Milwaukee, Briggs & Stratton, Jet, Bosch, Makita, Powermatic, Campbell Hausfield, Bostitch, Festool, Ryobi, Dremel, Electrolux, Black & Decker, Fein, Generac, Hunter, Porter & Cable, GreenWorks, Wilton, Senco, and hundreds of others. The site is very easy to use allowing customers to browse via categories or the search bar, which accepts keywords or ctalog item numbers so you can get to the product page quickly. Under Tools & Equipment you will find Power Tools (Drills, Saws, Sanders), Metalwork Tools (Metal Saws, Drill Presses, Grinders, Milling Machines, Formers, Shears, and Nibblers), Woodworking Tools (Drilling Machines, Presses, Routers & Trimmers, Planers, Jointers, Lathes, and Dust management). Under Automotive you will find tools and supplies for Body Repair (Hammers, Dent Repair Tools, Stripe Removal Tools), Electrical Testers (Battery Chargers, Power Packs, Circuit Testers), Standard & Hydraulic Jacks & Lifts, and all sorts of equipment for Brakes, Tires and Suspensions. The Home & Garden Improvement section includes Generators, Water Heaters, Ceiling Fans & Thermostats, Vacuum Cleaners, Steamers, Generators, Lawn Mowers & Trimmers, Pressure Washers, and Cutting & Trimming Tools (Saws, Chainsaws, Axes, Shears). There are many more products available on the site if you dig through the categories, and these listings can be refined by price range, condition, brand, user rating, popularity, and other parameters. There is also a special Deals page where you can find deeply discounted products. CPO Outlets accept payment in the form of Credit Card (Visa, MasterCard, American Express, Discover) and PayPal, which you can use to checkout. 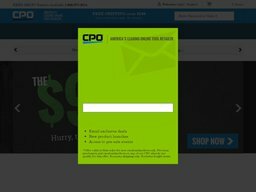 Any CPO Outlets coupon code can be redeemed by entering it in to a special box before the payment step. At this time CPO Outlets will only ship within the 48 US contiguous states, excluding any other US addresses, Canada and international orders. They will often run a free shipping promotion that allows you to get free economy shipping if you spend over a certain amount. This will be highlighted at the top of the homepage. You may also need to use a CPO Outlets coupon code to claim it. Orders made before 5pm will be dispatched the same day by UPS. If you do not meet the free shipping threshold there is a flat rate of $6.99 per order, unless the total weight exceeds 150lbs. At this point you will be charged based on the weight. To get an accurate calculation of the cost you should add heavy items to your basket and enter a delivery address. The store offers a no-hassle guarantee for all their items, which means that you are free to return them and get a full refund or exchange within 30 days of the original purchase date on new items, and 60 days on items that have been reconditioned. Unwanted new items must be in their brand new and original condition to be accepted and unwanted reconditioned items must be in the same condition as sold. They advise using an insured shipping method. Unless you received items in a damaged or defective condition and are making a claim, you must cover all shipping costs.